Jeb Bush cannot fix his campaign, is screwed. 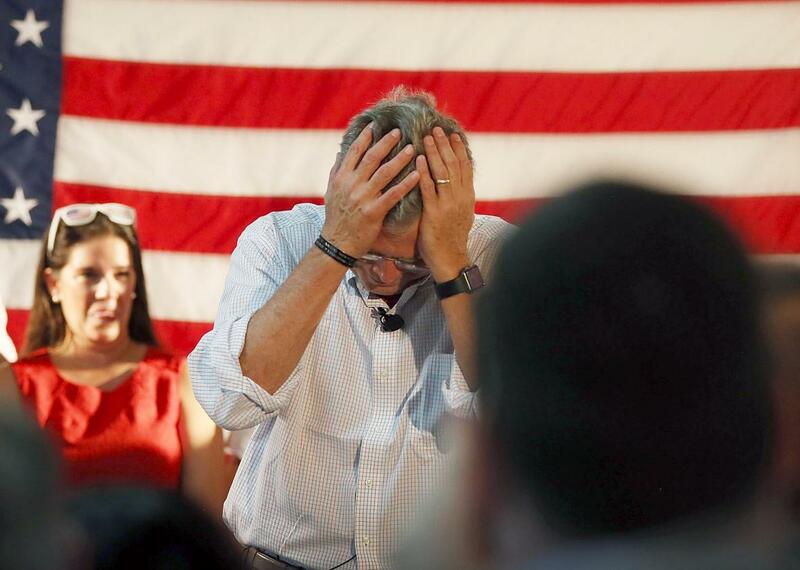 Jeb Bush holds his head after making a comment about fellow Republican primary candidate Donald Trump not wanting him to speak Spanish as he speaks during a Miami field office opening on Sept. 12, 2015. This week, though, brought new signs that the former Florida governor has even more to fix than most observers thought. Why is this a problem for Jeb? For starters, those are hardly the most damning attacks. But it’s also never a good idea to warn your opponent before you open fire. If Bush didn’t learn that lesson after Rubio schooled him during the previous debate, he and his super PAC should know it now. The morning after the Times story went live, Rubio was ready with a 30-second ad highlighting the many times that his former mentor was caught on camera lavishing him with praise. Bush’s allies can press forward with their attacks anyway, but Marco’s made it clear he has a ready-made defense to blunt any damage. If this wasn’t an unforced error on the part of Bush’s super PAC, it could represent something even worse for Jeb: A grudging acknowledgment from Bush’s allies that they can’t actually derail Rubio’s campaign—either because they believe his political ties to Jeb make him immune to their attacks, or because they believe the GOP establishment will step in to prevent Rubio from being battered too badly. (In these scenarios, the leak only telegraphed $20 million worth of negative ads that were never actually coming.) Bush’s well-funded super PAC was supposed to be his biggest advantage in this race. It still has millions in the bank, but right now it’s unclear whether it can put that cash to good use. The bad news for Bush doesn’t end there either. Bush’s team has also rolled out campaign committees with dozens of names from across the country, with the aim of portraying a vast network helping the former governor. Yet interviews show the campaign’s Jewish Leadership Committee, for example, is mostly a fundraising organ at this point. The Religious Freedom Advisory Committee has done little advising. And the Hispanic Steering Committee has existed mostly in name only. For everything that has gone wrong for Bush since he entered the race as the default favorite for his party’s nomination, he still has a plausible path to victory: hope Rubio wilts under an onslaught of criticism, and then rely on the organizational advantages of an establishment favorite to nickel and dime his way to a delegate victory before next summer’s convention. But if Bush’s super PAC can’t help him achieve the former, and his ground game can’t help him with latter, Jeb will have to do more than just fix his campaign. He’ll need to scrap it.